Objective : The primary objective of this study was to evaluate pediatric residents' ability to correctly identify electrocardiogram (ECG) findings and pair them to a corresponding cardiac diagnosis. Methods: Forty-six pediatric residents from the Johns Hopkins Children's Center were surveyed to evaluate their ability to interpret ECGs and factors affecting that ability. Included in the survey was a packet of 10 patient vignettes each accompanied by a 12-lead ECG. The primary outcome variable was the resident's score of correctly paired ECG findings with the appropriate cardiac diagnosis. One point was given for each pair correctly identified for a maximum of 10 points. Simple and multiple linear regression was used to estimate the magnitude and significance of any association between score of correct responses and resident year, completion of a pediatric cardiology rotation, self-rated ability to read ECGs, and training received in reading ECGs. Results : The mean number of correct ECG findings and cardiac diagnosis pairings out of 10 for the PGY 1 group was 4.1 ± 3, PGY 2 group 4.9 ± 2.9, PGY 3 group 6.6 ± 2, and the PGY 4 group 6.8 ± 1.7. In the unadjusted linear regression model, the PGY 3 group correctly identified 2.4 more pairings compared to the PGY 1 group (P =0.02). Those who completed a pediatric cardiology rotation correctly identified 2.5 more pairings compared to those who did not complete a rotation (P=0.001). Conclusions: ECG interpretation significantly improved from PGY 1 to PGY 3. Educational programs involving ECG interpretation should target those diagnoses with high clinical severity and average to poor resident knowledge. With this number of potential indications pediatricians working in an outpatient setting will have many opportunities to obtain and at least preliminarily, interpret ECGs. Content specifications for the certifying exam from the American Board of Pediatrics includes, but is not limited to, knowledge of the cardiovascular causes of chest pain and syncope, recognition of the clinical findings of children with an atrial septal defect (ASD), ventricular septal defect (VSD), myocarditis, and pericarditis, and identification of a prolonged QT interval, supraventricular tachycardia (SVT), and ventricular tachycardia (VT). The workup for many of these disorders will often include an ECG. Therefore, pediatric residents should be aware of the indications for obtaining an ECG and be competent in interpreting ECG findings and linking them to a potential cardiac disorder. Research examining pediatric resident's ability to interpret ECGs has been limited. Studies performed in the pediatric emergency department (ED) setting have revealed an ECG interpretation concordance rate of 76% to 87% between ED staff and pediatric cardiologists and a 61% rate between ED staff and a computer generated reading. ,, The concern is that possibly 13% to 39% of ECGs in the ED setting may be misinterpreted leading to clinically significant adverse outcomes. One additional pediatric study in a controlled environment revealed that senior residents and interns on average correctly identified 66% and 55% of common ECG diagnoses, respectively. The purpose of that study was to document pediatric resident's ability to correctly interpret common ECG diagnoses and determine if interpreting ability improved from postgraduate year (PGY) 1 to PGY 3. This study is different in that we utilized case-based vignettes to test resident's ability to correctly identify the ECG finding and pair it to a corresponding cardiac diagnosis. Additionally, we sought to document pediatric resident's knowledge of indications for obtaining an ECG and determine if self-rated ability to interpret ECGs, training in reading ECGs, or completing a cardiology rotation influenced overall ECG interpretation ability by year of training. Between June and December of 2005, a convenience sample of pediatric residents from the Johns Hopkins Children's Center were surveyed to evaluate their ability to interpret ECGs. Participating residents were in the first 6 months of their intern year (PGY 1), second year (PGY 2), or third year (PGY 3) as well as a group who were in the last month of their third year (PGY 4). We included the PGY 4 group to represent those residents who had completed their training. The initial component of the survey asked the participating residents if they had completed a pediatric cardiology rotation, how well they would rate their ability to read and interpret pediatric ECGs, how much training they had received regarding the reading and interpreting of pediatric ECGs, how important is the ECG when addressing pediatric cardiology issues, and would they routinely obtain an ECG as part of the evaluation for ADHD, chest pain, sports participation, murmur, acute life threatening event (ALTE), syncope, drug ingestion, and new onset seizures. Answers to the questions regarding ability and training to read and interpret ECGs as well as the importance of the ECG when addressing pediatric cardiology issues were based on a Likert scale of 1 (not well, none, or not at all important) to 5 (excellent, more than enough, or extremely important). Included in the survey was a packet of 10 patient vignettes each accompanied by a 12-lead ECG. 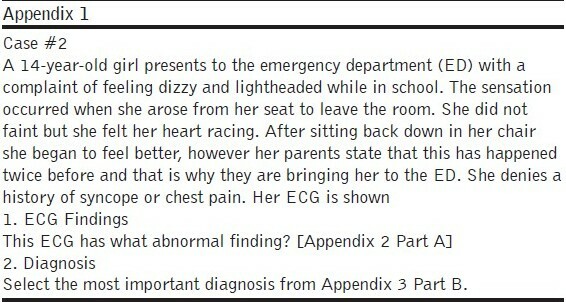 The vignettes were written by the authors to represent typical case scenarios where an ECG may be indicated. An example is shown in Appendix 1. For each vignette, residents were asked to identify a specific ECG finding and corresponding diagnosis from a pre-formulated list of choices (Appendices 2 and 3). ECG findings and cardiac diagnoses included in the study were based on the 2004 cardiovascular disorders content specifications from the American Board of Pediatrics and opinions of the pediatric cardiology faculty at the Johns Hopkins Children's Center. Prior to the start of the study, the survey was completed by two pediatric cardiology fellows and one faculty member to test for content and validity. The institutional review board at the Johns Hopkins Bayview Medical Center approved the study and a consent recruitment statement was supplied to all participants. The primary outcome was the resident's ability to pair the ECG finding with the cardiac diagnosis. One point was given for each pair correctly identified for a maximum of 10 points. For example, considering the case listed in Appendix 1, the study participant had to identify the ECG finding as a short PR interval and the diagnosis as Wolff-Parkinson-White (WPW) syndrome in order to obtain 1 point. Secondary outcomes included the affect of resident's self rated ability to read ECGs, training received in reading ECGs, the importance of obtaining an ECG when dealing with cardiac issues, and selected indications for obtaining an ECG on the primary outcome. Data analysis was performed with the use of STATA version 9.0 (StataCorp LP, College Station, Texas). Means were calculated for continuous variables. Simple and multiple linear regression was used to estimate the magnitude and significance of any association between total points given for ECG finding and cardiac diagnosis pairs correctly identified and resident year, completion of a pediatric cardiology rotation, self-rated ability to read ECGs, and training received in reading ECGs. PGY 1 was used as the reference resident year. The linear coefficient and 95% confidence intervals (CI) are reported with a P value of < 0.05 considered significant. Out of 108 potential resident participants, 46 completed the study for a response rate of 43%. The distribution of residents by year was 10 PGY1, 13 PGY2, 13 PGY3, and 10 PGY 4. Of those residents who completed the study 28 (61%) had completed a pediatric cardiology rotation-3 PGY1, 8 PGY 2, 7 PGY 3, and 10 PGY 4. 56% of residents rated their ability to read and interpret ECGs as low [Figure 1]. More than half (54%) listed that they had received little training in the reading and interpreting of ECGs [Figure 2]. However, 74% believed that ECGs are very to extremely important when addressing pediatric cardiology issues [Figure 3]. Fifteen (33%) of residents selected starting stimulant medications for ADHD as an indication for obtaining an ECG, 45 (98%) selected chest pain, 3 (7%) selected sports participation, 28 (61%) selected heart murmur, 37 (80%) selected ALTE, 45 (98%) selected syncope, 39 (85%) selected drug ingestion, and 9 (20%) selected new onset seizures. The number of residents who identified the correct ECG finding and cardiac diagnosis based on the 10 vignettes is shown in [Table 1]. Using a score of 85% or greater, the most identifiable ECG findings were A-V disassociation, narrow complex tachycardia, wide complex tachycardia, and right ventricular hypertrophy (RVH). The most identifiable cardiac diagnoses were WPW syndrome, ventricular tachycardia (VT), and cor pulmonale. The mean number of correct ECG findings and cardiac diagnosis pairings out of 10 for the PGY 1 group was 4.1 ± 3, PGY 2 group 4.9 ± 2.9, PGY 3 group 6.6 ± 2, and the PGY 4 group 6.8 ± 1.7. In the unadjusted linear regression model, the PGY 3 and PGY 4 groups correctly identified approximately 2.5 more pairings compared to the PGY 1 group [Table 2]. Additionally, those who completed a pediatric cardiology rotation correctly identified 2.5 more pairings compared to those who did not complete a rotation. For each point increase in the Likert scale for selfrated ability and received training in reading and interpreting ECGs the residents correctly identified 1 additional pairing. Adjusting for resident year, completed pediatric cardiology rotation, selfrated ability to read and interpret ECGs, and received training in reading and interpreting ECGs, only those residents completing a pediatric cardiology rotation were better at identifying correct pairings (coefficient 2.0, P =0.03;) [Table 2]. This study indicates that pediatric residents' ability to read and interpret ECGs improves significantly from PGY 1 to PGY 3 and among those who complete a pediatric cardiology rotation. Additionally and not surprisingly, those residents who received more training and rated their ability to read and interpret ECGs higher were better able to correctly identify ECG findings and cardiac diagnosis pairs. Of all of the variables completing a pediatric cardiology rotation was the strongest predictor of ECG reading and interpreting ability [Table 2]. Incorporating a cardiology rotation into all pediatric residency training programs may have the potential to significantly improve trainees' ability to read and interpret ECGs. Additionally, residents completing a cardiology rotation will have opportunities to discuss the indications for obtaining an ECG and learn about those cardiac conditions with moderate to high clinical severity that require cardiology consultation. Indications for obtaining an ECG in children have traditionally included chest pain, heart murmur, ALTE, new onset seizures, syncope, and drug ingestion. , Other indications continue to be debated and these include athletes undergoing a pre-participation sports exam and initiation of stimulant medications for children with ADHD. ,, Most residents in this study selected chest pain, ALTE, syncope, and drug ingestion (80--98%). Fewer selected heart murmur, sports participation, initiation of stimulant medications for ADHD, and new onset seizures (7%-61%). Guidelines from academies such as the AAP, AHA, and American College of Cardiology (ACC) that outline specific indications for obtaining ECGs in children may enhance the training of pediatric residents and help to focus teaching on those cardiac conditions with identifiable ECG abnormalities and moderate to high clinical severity. In a prior study, a grading system for pediatric ECG findings was developed to designate clinical severity. Grade II findings were designated moderate requiring cardiology follow up and grade III findings were designated significant requiring immediate cardiology involvement. In our study, 9 of the 10 vignettes were associated with an abnormal ECG finding/cardiac diagnosis pairing and using this grading scheme 4 would be considered a grade II abnormality (short pr interval/WPW, bradycardia/long QT syndrome, superior axis/endocardial cushion defect, and RVH/cor pulmonale) and 4 would be considered a grade III abnormality (A-V disassociation/complete heart block, narrow complex tachycardia/supraventricular tachycardia (SVT), wide complex tachycardia/VT, and abnormal T wave inversion/anomalous left coronary artery). The other abnormal pairing in our study, low-voltage QRS/myocarditis or pericarditis, was not included in the grading scheme developed by Wathen but we believe would be considered a significant finding warranting immediate cardiology referral. Regarding cardiac diagnoses, residents in this study were excellent at identifying WPW, VT, and cor pulmonale (85--96%). They were average in identifying complete heart block, long QT syndrome, and SVT (74--80%), and poor in identifying anomalous left coronary artery, endocardial cushion defect, and myocarditis/pericarditis (33--59%). Educational programs involving ECG interpretation should target those diagnoses with high clinical severity and average to poor resident knowledge such as those identified in this study. Residents who go on to work in ambulatory settings that care for children will have numerous opportunities to order ECGs and initially review and interpret the findings. Most of these opportunities will likely come in acute care settings such as urgent care centers and emergency departments where findings will often direct patient care, disposition, and follow up. However, if indications for obtaining an ECG expand those working in primary care settings will also need to be knowledgeable in ECG interpretation when they are called upon to initially review an ECG before it can be read and interpreted by a pediatric cardiologist. There were limitations to this study that warrant further discussion. We conducted a cross-sectional survey at one institution and results may not be generalizable across all pediatric resident training programs. The response rate in this study was low raising the possibility of reporting bias. Such a bias could potentially skew the results to show no difference among the groups if those completing the survey had an interest in cardiology and had increased competence in interpreting ECGs. Additionally, the small sample size may have affected our ability to observe meaningful differences in the adjusted analysis among resident groups. However, despite the small sample size, the number of residents participating in the study was distributed evenly by year of training and we were able to demonstrate a statistically significant improvement in ECG interpretation skill from PGY 1 to PGY 3. Finally, the vignettes were limited in scope and were not representative of other serious cardiac conditions that may present with subtle ECG findings. 1. Perrin JM, Friedman RA, Knilans TK. Cardiovascular monitoring and stimulant drugs for attention deficit/hyperactivity disorder. Pediatrics 2008;122:451-3. 3. Corrado D, Pelliccia A, Bjornstad HH, Vanhees L, Biffi A, Borjesson M, et al. Cardiovascular pre-participation screening of young competitive athletes for prevention of sudden death: Proposal for a common European protocol. Eur Heart J 2005;26:516-24. 5. Wathen JE, Rewers AB, Yetman AT, Schaffer MS. Accuracy of ECG interpretation in the pediatric emergency department. Ann Emerg Med 2005;46:507-11. 6. American Academy of Pediatrics. Cardiovascular Disorders in 2008 Content Specifications and PREP Study Guide. 2008. p. 51-3. Karimzadeh, P., Kiumarsi, A., Yousefi Zoshk, M.